When you create high-quality imagery and prints, you need to protect them as well. Make sure your signage and displays stand the test of time with the right wide format laminator. Tell us what you want to achieve with your wide format laminator, and we can recommend the machine for you. We only stock market tested and proven products from the leading manufacturers in the industry. We can help you with ongoing customer care and support with your laminator as well as consumables supply. We offer competitive prices on our wide format laminators along with our superior customer service. 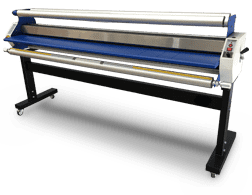 The Neolt Shield wide format laminator was designed to be versatile and adaptive to a wide range of laminating applications and media types. The Denmark heat assisted wide format laminator comes with variable speed control of up to seven meters per minute for high volume output. 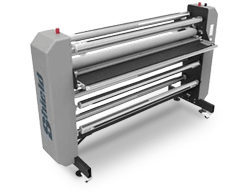 The Baltic cold wide format laminator comes with five interchangeable mandrels for versatile print finishing, laminating, and mounting. Need advice on wide format laminators? Our team is always happy to help. What is the size you need to laminate? The size of the prints you need to laminate will determine which machines will be suitable for you. We have a range of wide format laminators to suit even the largest prints, up to 1,650mm or 65 inches. How much volume do you need to output? 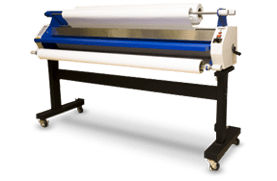 Some wide format laminators may be better suited to your business than others depending on the speed and volume you need to output. Does the laminator support your media? The best laminator for your business will depend on which types of printable media you need to use with it. We have wide format laminators which support any kind of media you use, including paper, film, and self-adhesive vinyl. We can also advise you on laminators which include options for board and substrate mounting. 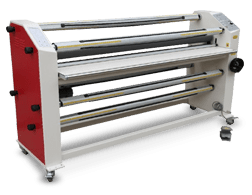 Do you need hot or cold laminating? Laminators use either heat or pressure, or both to activate the adhesive. Hot or cold laminating may be preferable depending on your desired outcome and the media you use. We can advise on whether hot or cold laminating would be better for your operation. "Tyson and the team at Total Image Supplies are my first stop for all things wide format, they deliver good quality stock, quickly and efficiently and at a good price! Tyson knows his products and is always happy to assist with questions about both the media and the machines to help our jobs look amazing."